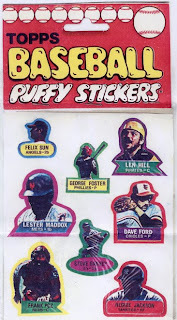 I got an e-mail from Scott Gaynor (of Gaynor & Dent Auctions) the other day, inquiring about certain aspects of the 1980 Topps Superstar and undated Puffy Stickers (more on this anon) and as we got into back-and-forthing, Scott sent along some scans of items he had been consigned in 2001 by a Topps salesman. 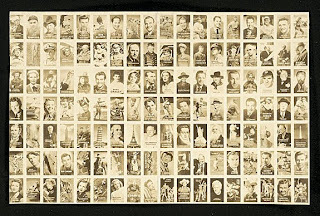 These scans were of different mockups and prototypes used by Topps executives to develop new product and some made it into production, altered sometimes but sometimes not. 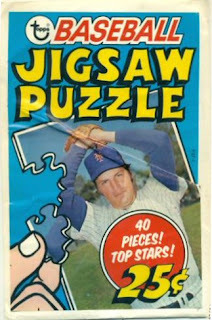 So not only was Topps thinking small in 1975, they were also thinking big! 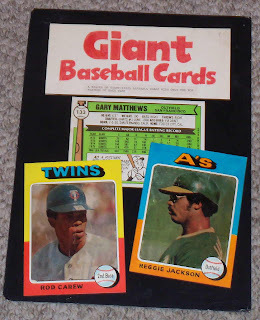 They didn't issue big baseball cards until 1980, and then they spent the better part of the first half of the MTV decade putting out supersized product. 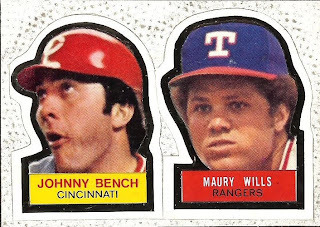 This timeline from development to execution was not unusual for Topps back then. Stay tuned for more mockups and prototypes in 2010! QUICK UPDATE-An intrepid reader has noted that the back of the prototype is from 1976. In my haste to post, I missed this important detail. No, we're not here to talk Sinatra, although your webmaster is a huge fan of Ol' Blue Eyes 50's and 60's sides. Tonight it's rings, baby and not those fancy metal ones; tonight we're talking cardboard! And good luck if you want to complete the set! Plus the checklist is a killer if you want to complete the football set. 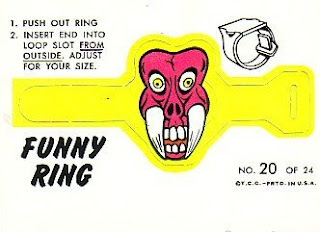 None of those Funny Rings pieces are mine by the way, I'll get a hold of an example someday. Does this ring look familiar? Something old, something new today kids, one of which may be borrowed and one of which is blue. One other, potentially more disturbing tidbit is that the 1980 Superstar Stickers may not be what the Standard Catalog says they are. Bob Lemke's blog explains it here and we'll see if they take a big mulligan in 2011. 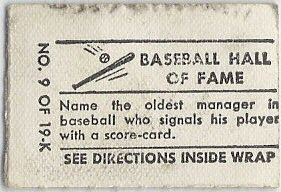 One of the earlier quirky items in the Topps pantheon goes back to 1956 and the inclusion of two unnumbered baseball checklists that were likely inserted only in nickel packs (and probably whatever larger cello packs existed) and for the first time gave the card buying public a look at the full lineup of players available to collect. I once thought it was silly that Topps had never offered a checklist card to show who was in their sets but the truth of the matter is they were probably so unsure of what players Bowman would lock up or sue over that a published list might have made them look inept if it was full of holes. Once the Bowman purchase was finalized in the early winter of 1956 it was off to the races and they never looked back. 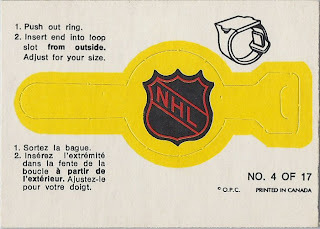 Topps used a skip numbered approach to the two checklists, showing Series 1 and 3 on one and 2 and 4 on the other. This was a smart move as it allowed a glimpse into the distant future (beyond the next series) and also marks the beginning of their later method of providing a preview checklist of an upcoming series with the prior series' cards. I call this the Theory of Checklist Relativity and I'll be exploring that theme further in 2010. While these are not that easy to find in unchecked, decent shape today and nice examples certainly warrant a premium, there are plenty available on Ebay if you want them. These two backs are likely the same color cardboard, the scans make it appear one is lighter than the other but I don't think that's the case. 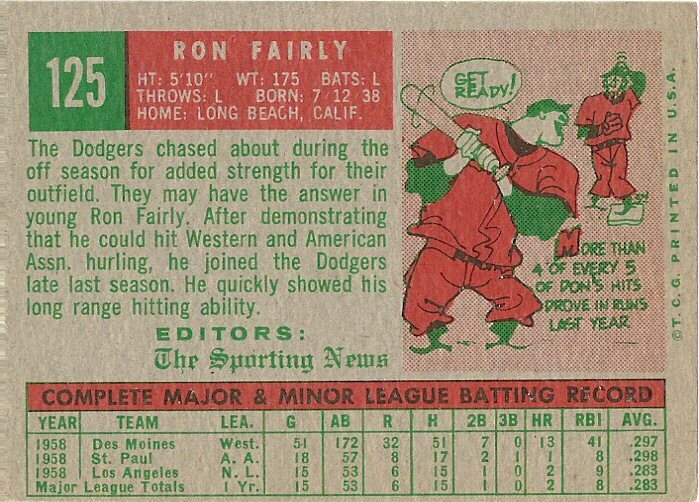 Notice how the team cards (an innovation for '56) are highlighted in red. I've been contemplating how and when these were inserted into the packs and the strange cut on the 1/3 checklist indicates it may have been part of a sheet sliced into vertical strips and cut at high speed as the strip moved through the cutter, as opposed to being cut as part of a larger stack that was lying flat when the blade or wire fell. That right hand column is a double print of the one next to it; you could just run a string of checklists down the right side on the final run. 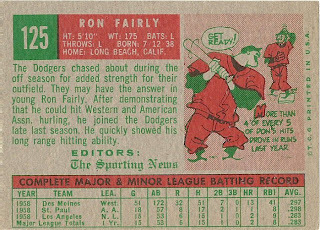 However, I doubt this was the case and there were other insert cards starting to appear in '56 so all those contest and promo cards of a similar look may all have been printed outside of the normal set runs. 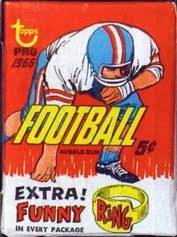 These kicked into high gear with the '56 football set (which also has a checklist card) so Topps was clearly enamored of the process at the time. 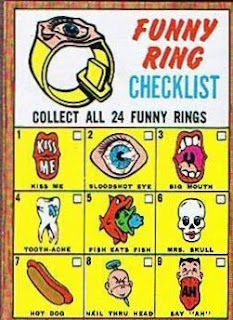 To me the logical place to insert the checklists would have been at the end of the first series runs. 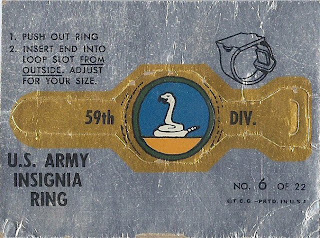 I am missing a crucial bit of information though, as there is white and gray stock used for the cards in '56 and I believe only the gray stock appears with the checklists but am not 100% certain on that point. 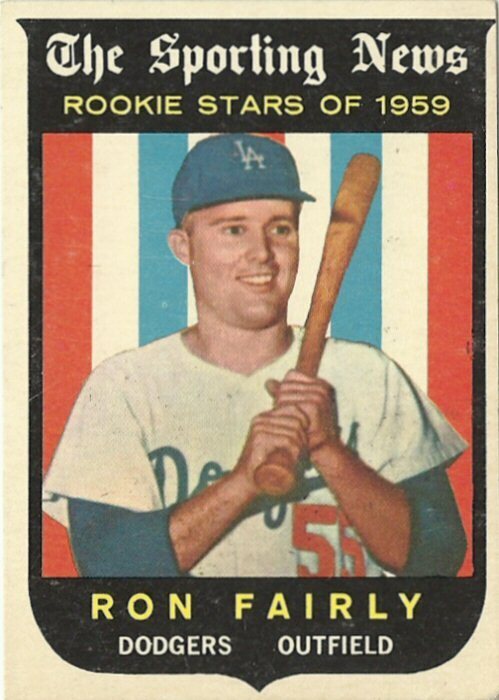 If that is the case, it may mean the white stock first series cards formed the first print run in '56. I also am unaware of any anecdotal evidence of how these came out of the packs and if they only came out of packs with gray backed cards or if they could be found with whites as well. I would also like to figure out if penny packs only came with one color of stock but that is an investigation requiring someone more like Sherlock Holmes to get involved! Well, a little more information has dribbled in on the Rookie Banquet Programs and I figured it was a good topic for a catch up thread on a blustery day here at the Archive. I'm going to work my way back in time, probably because I watched the new Star Trek movie last night and I'm just going with the theme. Friend o' the Archive Chuck Lumb left a comment here recently about the '64 program and confirmed it was issued along with the card set. 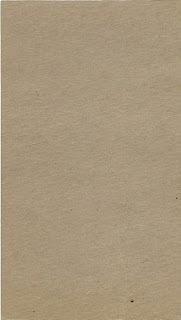 He describes it as 3 3/16" wide by 5 5/16" tall, or just slightly larger than the dimensions of the cards. No scan yet but it would have to replicate the box cover for the card set. 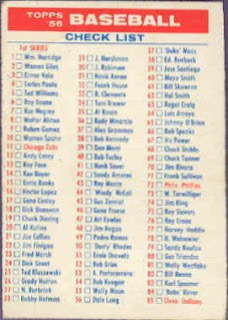 Chuck also advises that Luis Tiant is page #35 in the program but he is card #34a in the set. 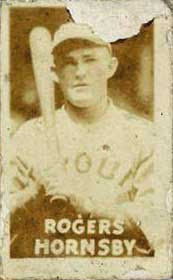 Topps numbering bugaboos are old school by now! That is one kickin' cover. 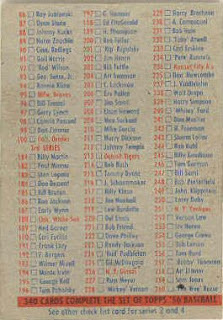 There is an interior shot at the 4192cards.com site as well, along with a veritable plethora of Pete Rose goodies. I'll try to scour the web for our missing covers and get back to you all shortly. 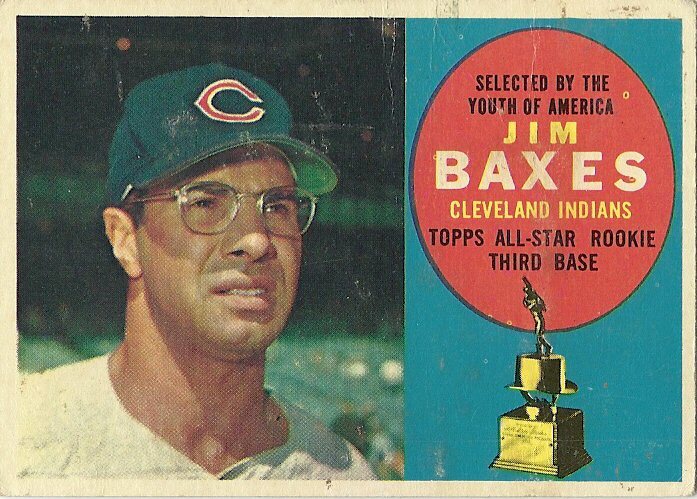 Topps started their thirteen year run of Bazooka baseball package design (mostly) cards in 1959 with a modest issue of nine large, colorful cards. Hard to find today, especially in nice shape these cards measure 2 13/16" x 4 15/16" when trimmed properly. 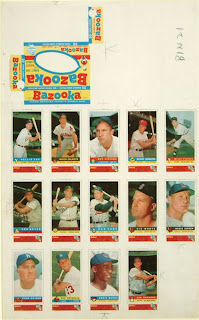 Found on the backs of 25 count Bazooka Bubble Gum boxes and designed to be carefully (or not) cut out, these are the largest cards Bazooka would issue and appear to have been designed to portray one player from each position on the diamond. 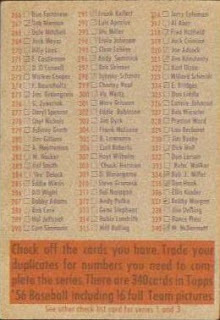 Soon after the nine cards apparently sold through another fourteen were printed up, bring the set total to 23 (or 24 if you count both Hank Aaron variations as his name shows up in either white or yellow, the latter being easier). These fourteen cards are considered to be short printed, so my guess is the first series was reintroduced. Aaron is in the first group of nine so the variation seems to have occurred during the second run of his cards. That's a classic looking card if you ask me! 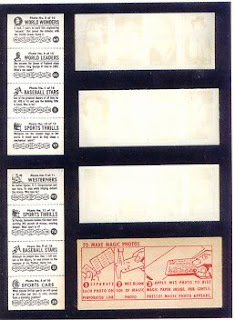 A proof sheet exists that has all 14 short prints and a box displayed, I believe this was from Topps Vault but cannot swear to it. 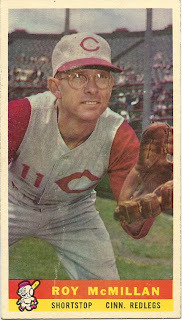 Checklists can be found with ease but the extra prints (all first run) are: Aaron, Cepeda, Crandall, Davenport, Mantle, Mays, Mazeroski, McMillan and Turley. There are two Braves, two Yankees (those teams had met in the two previous Fall Classics) and a single rep apiece from the Pirates and Redlegs in the first run and a whopping three Giants, including Davenport, who was a good but not All-Star caliber player at the time. His inclusion leads me to believe the first series may have been planned as part of a West Coast or even Northern California centered promotion. It also could have been a "soft" test on both coasts and mid country to gauge interest. Mazeroski was starting a solid run of Gold Gloves and All Star selections in '58 and was a legitimate MVP candidate that year, Turley was MVP of the '58 World Series and Roy McMillan was considered to be a top level shortstop in the late 50's, so all of the players, excepting Davenport, were players you would expect to see in a small set of well known players. 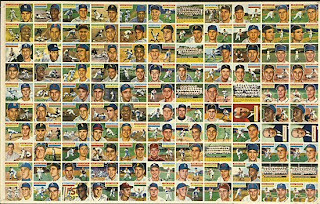 The next batch of fourteen cards repeated no teams that appeared in the first nine cards and brought the representation to the full slate of 16 teams. With the exception of the White Sox, Dodgers and Red Sox, who had two players, every remaining team had a lone player in the last series. 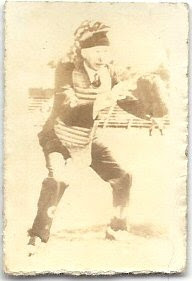 A football set was produced later in the year. I'll explore that another time. 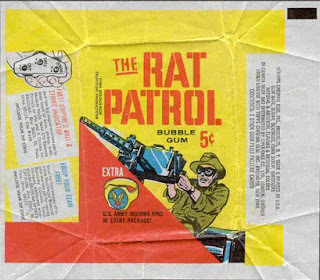 Those little Topps cards that used to come inserted between the inner and outer wraps of Topps gum in the late 40's through mid 50's have always been a subject I enjoy researching, as relatively little is known about them compared to their more grown-up siblings. This lack of scrutiny has left us with some confusion that is carried over this day into the various guide books and tales told between grizzled old hobby veterans. 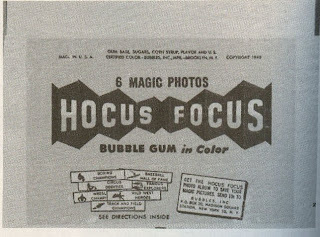 One such area of confusion applies to the 1948/49 Magic Photos and 1955/56 Hocus Focus issues as there are many similarities between the two sets. The 1948/49 Magic Photos were one of the first Topps issues and they met with huge success and can be found pretty easily even now, some sixty plus years after they first appeared. The idea was to spit on or otherwise moisten the front of the card and then rub it against the wrapper which contained some (hopefully) benign "developing" chemicals. Sunlight probably aided the process as well. (Series I not used, likely to avoid confusion). I cannot say who owns that album and I found those shots on Ebay. The "In Color" teaser applies to the gum, not the cards! Note the offer for the album on the wrapper. Take a good look at that back of the Connie Mack as it's the easiest way to tell the Magic Photos apart from their descendants in 1955/56. 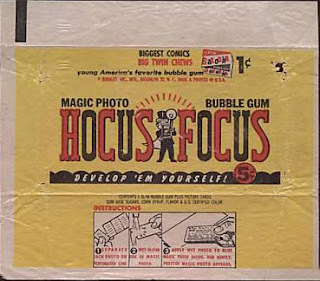 "See Directions Inside Wrap" indicates it's a Magic Photo but in 1955 Hocus Focus came out and muddied the waters. 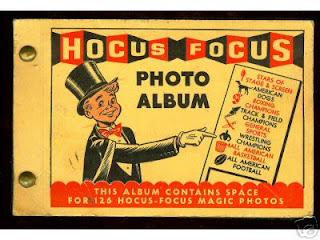 As you can see, it clearly states "Hocus Focus" on the back and that is the big difference between the sets-Magic Photos will NEVER say this. 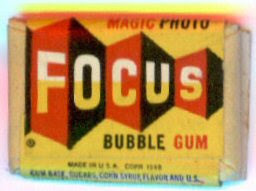 Hocus Focus also have the black circle with overall number of the card in the set in the lower right corner of the reverse, in addition to any subset numbering. No album exists for the Hocus Focus cards and they probably sold poorly as these were the last of this breed of card issued by Topps. The Hocus Focus checklists are a mess and intertwined in many publications. The larger cards have 96 subjects while the small ones theoretically have 121 although I think up to 131 is possible due to how the subsets are structured. Not all small cards are even known at this juncture and the larger ones are probably all identified but since the lists are out of whack, I am visually confirming each larger card (abou 20 to go). I've given up on the smaller ones, I only have about five confirmed visually right now. That is 96 cards folks! 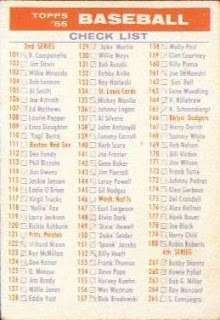 Now, the small cards have a subset of 23 Baseball Stars and 15 Airplanes, so if each subset is five greater than found in the large cards, we would have 136 cards total but most guides say 121, although I have to think 126 is also possible due to the size of the two Magic Photos main series, the fact the Magic Photos and small Hocus Focus cards have the same measurements (see next paragraph) and the array on the Magic Photos uncut sheet. Sizing is the same for the Magic Photos, no matter which way they were sold and they measure 7/8" x 1 7/16" while the small Hocus Focus cards are also 7/8" x 1 7/16" and the large cards are 1" x 1 5/8". 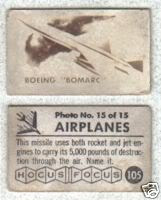 Send me a note if you have front and back scans of any small Hocus Focus cards. 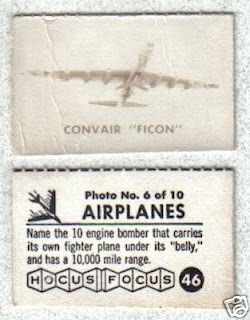 I also need front and back scans of these large Hocus Focus Cards: 2 8 9 11 16 26 32 34 40 41 43 48 56 57 60 67 76 79 95. And that little fat kid in the middle on the bottom of the sheet looks faintly like Elroy Jetson, don't you think? Not much else to say tonight, so enjoy the links! Every once in a while, something pops up in the Topps universe that wasn't expected. I've not dwelled too much on the end of the 1970's here as there is not a whole lot to discuss outside the mainstream from 1975 until the end of the decade in 1980 but there were glimpses of innovation here and there. 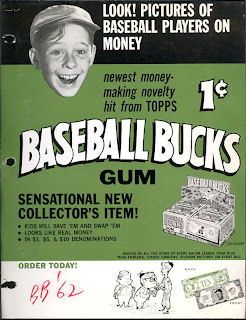 Oh, on the baseball front there are the '76 Cloth Sticker Prototypes and the skip-year supplemental sets in '75 (Mini's), '77 (Cloth Stickers) and '79 (Comics) but after the Oil Embargo started in the fall of 1973 there just wasn't much being spent on new product research at Topps (or anywhere else) and the quirkiness was essentially wrung out of the production cycle as the economies of scale changed almost overnight. 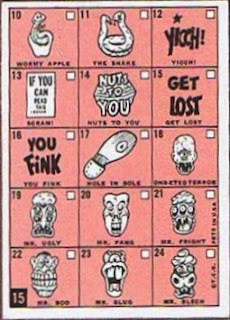 All the crazy test issues and metamorphic inserts, all the punch out cards and scratchoffs, all the flocked stickers and intricately plotted mixed media sets were just discontinued, seemingly overnight. 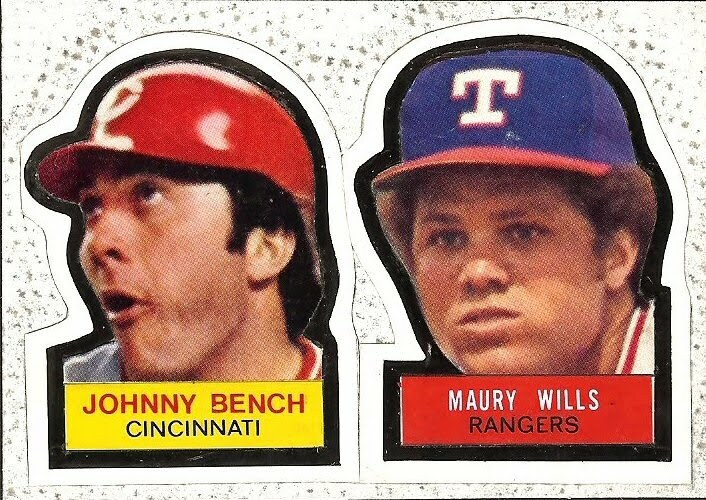 That is NOT the best shot I have ever seen of Johnny Bench by the way. The stickers are purported to be one-of-ones, which means these were probably just produced in house as part of a design process. 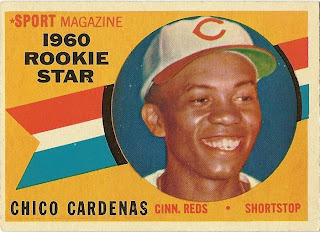 So why the sudden rebirth of creativity in 1980 at Topps? 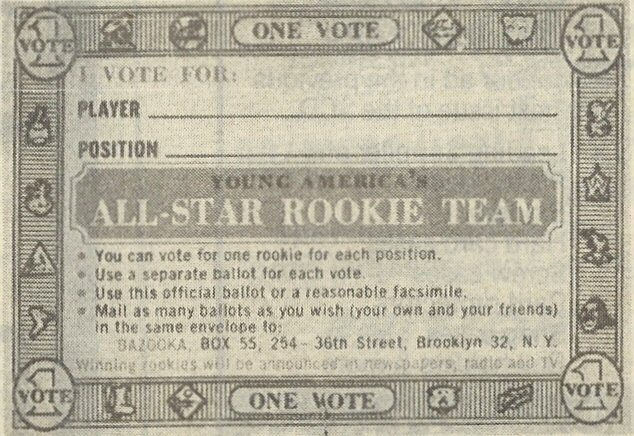 Well, they knew their exclusive deal to sell baseball cards was about to expire (see paragraph 8) and there would be competition in 1981 from Fleer (and as it turned out, Donruss). Nothing like a little competitive pressure to get the creative juices flowing! By the by, if you read above the Fleer decison in the link, you come acress the "right to publicity" case stemming from Bowman's (Haelan Laboratories) earlier suit against Topps and which is the foundation for the right of people to license or control their own likeness-It was a landmark decision. The 1980's would bring a rebirth of the supplemental and test sets from Duryea and a steady stream became a torrent by the end of the MTV decade. I've really had a cutoff of 1980 in my archiving endeavors but I may extend that by another decade. We'll see. Programs, Get Your Programs Here! 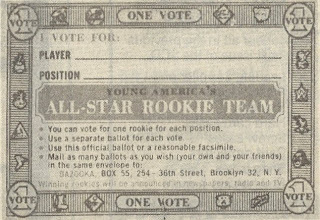 Meanwhile, back on the rubber chicken circuit...a discussion of some early Topps Rookie All Star Banquet Programs. Few of these have survived the years and I cannot even lay claim to owning more than one (1962) or even having a full run of scans covering the years the program was a full-blown affair (1959-66). So I'll show what I have and hope our faithful readership can fill in the blanks. I'd say it's pretty optimistic when the event goes annual, even the first time out! That was from an Ebay auction a while back, one of the few I've seen over the years. Jim Baxes was indeed one of the first ten winners of the annual award, as seen in the prior thread on 1964 Rookie Banquet Cards. You can see the floating heads that were later co-opted for the '64 Banquet cards. 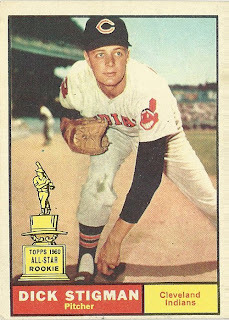 I need color scans from 1965-66 (and maybe '64--there are mixed reports if the card set issued that year negated the use of a bound program) and will post 'em if I get 'em. If not, I'll use some old SCD pictures. 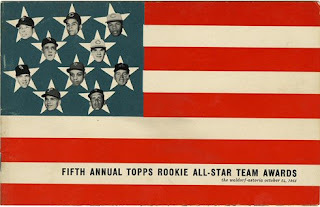 Topps switched to a different format for the program in 1967 (I think it went to four larger pages from the previous digest sized versions) but the banquet was still going strong in the mid 80's.